Another visit here with a big group of walkers. I think the place might have changed hands since my last visit. Six beers on handpumps including Ringwood best, Flying Scotsman Caledonian, Speckled hen, Hobgoblin. Food and beer both excellent, this has turned into a really nice pub. Comment: Nice country pub especially on a sunny day and the range of beers is excellent with some nice unusual ones. Beer always well kept and they run beer festivals a couple of times a year which rival the local CAMRA festival. Best Caterham pub? A bit far out to include in a crawl I think, but with their range just crawl their bar. Great pub, drank here for a few years on & off. Always 5-7 real ales on tap & a few lagers on tap as well. London Pride, Flying Scotsman, Hob Goblin, Butcombe, Ringwood Best, Tribute. + more. Friendly staff, landlord likes to keep noise in pub down, so family friendly. 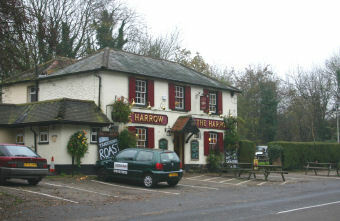 Yes, the food is pricey, but would rather pay �10-�12 for a fantastic main course as only pub in area with decent food. They also throw a beer festival twice a year in April & Ocrober. Nice pub, good selection of ale and a symonds cider, rare on draft. Inside is lovely. Food a bit pricy. Smashing country pub with friendly service and good ale. It was lovely to see Thwaites Wainwright on the bar - what a great pint this is and how fabulous to have such fine beer associated with that brilliant writer of walking books.